Two fields of non-man entry bores are subject to the use of IMPERMIX®. Microtunneling, and other pipe jacking methods, use the jacked pipe as a temporary support and the service pipe is slipped inside once the drive is completed. Large directional drilling bores under river or other natural obstacles may eventually require the bore to be grouted to seal the annulus created between the service pipe(s) and the ground. In long microtunneling drives, the number of options to fill the annulus is reduced. As in tunnels, flooding the annulus with the fluid IMPERMIX® self-hardening slurry is a very practical solution and cost effective. 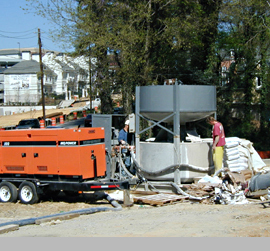 This operation can even take place after the manholes have been installed and the shafts backfilled by leaving standpipes at both ends. Such technique was used for a number of microtunnels at J.F.K. airport installed by CARP-SECA JV for the N.Y.-N.J. Port Authority, one in particular involving a CON EDISON duct bank under the Van Wyck Expressway. When directional drilling holes are reamed to diameters sometime over 40 inches, the void created is very substantial and questionable as to abandoning it after pulling the service pipe(s). A solution to provide a sealed bore and protection for the pipe (if metallic) is to drill the pilot bore with conventional mud, and switch to IMPERMIX® slurry when reaming begins. IMPERMIX® ingredients are fine enough for the slurry to be cleaned on the same shakers while reaming is in progress. IMPERMIX® will remain fluid during the few days required for completing the bore and pulling the service pipe in its permanent sheath. Instead of spending good money to dispose of the conventional mud being displaced by the pipe, displaced IMPERMIX® will set in a pit and will be disposed of as solid spoils.